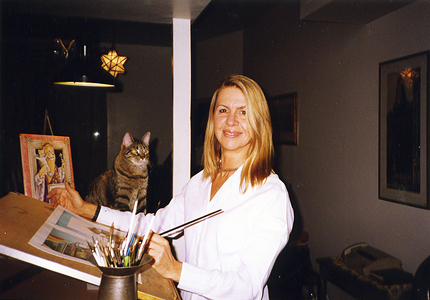 I was born and grew up in New York City, the daughter of two professional artists. Drawing and painting were always a big part of my life. I loved my books, too and as an only child, our family pets were my constant companions. It made sense that I developed an interest in illustrating children’s books. I attended the High School of Music and Art and then the State University of New York at Buffalo. Without training in illustration, I wrote and made pictures for a children’s book project. With this as my portfolio, I made the rounds of New York publishers and soon began to get work. My first book, “The Wish at the Top” by Clyde Robert Bulla, received a good review in the New York Times. My second book, entitled “Six Little Ducks” received an even better Times review, and was chosen as a Boston Globe/Horn Book honor book. I was off to a good start, and went on to publish over twenty picture books, eight of which I authored as well. Because my books usually feature animal characters, I am frequently asked to paint a portrait of a friend’s pet dog or cat. Some of these are fantasy portraits, and some are realistic, but either way, I look for the telling detail or expression that best demonstrates the animal’s personality. As commissioned works, these paintings have never been exhibited. They are making a debut in my website. I paint in two separate techniques: my illustrations are always watercolor with pen and ink, and my portraits are done in acrylics.